Dark Room ... Dark Room (free) is a full screen, distraction free, writing environment. Unlike standard word processors that focus on features, Dark Room is just about you and your text. Basically, Dark Room is a clone of the original WriteRoom that is an OS X (tiger) exclusive application. Q10 ... Full-screen. Live text statistics. Perfectly portable (A single self-contained executable file). Easy to use timer alarm (Perfect for timed writing sessions and word wars. When the time is over, it will tell you how many words you wrote in that period.). Autosaving. 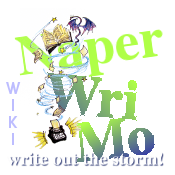 writemonkey ... Zenware for full screen distraction free creative writing. No whistles and bells, just empty screen, you and your words. WriteMonkey is light, fast, and perfectly handy for those who enjoy the simplicity of a typewriter but live in modern times. WriteMonkey closes the gap between simple editors like DarkRoom and full fledged word processors. It is fully customizable to meet the needs of any writer while maintaining a simple, clear user interface. Freemind is a very nifty open source software that does mind-mapping. Written in Java, it runs on multiple platforms and is extremely useful for brainstorming and organizing information. This is a neat free package that does idea generation by genre. See The Inspirator. Available for Linux and Windows (appears to be written in Python, so maybe also would work on OSX?). Papel is a free (abandonware) package for Windows (also works under Wine on Linux). It uses ASCII text files as its underlying data storage so you can use your favorite text editor on them (though sadly this is not automatically linked through Papel). Its strength is in how you can drag and drop "papels" (scenes, chapters, etc) anywhere on a desktop window and link them together to form your story. The resulting novel can then be exported to RTF or text. You can find it at papel.teiru.net/papel. It's free, portable, makes backups, has a storyboard/index card feature and stores characters separately from the novel. It also does word counts because it was developed with NaNo writers in mind. yWriter can be found here. Dropbox allows you to store your writing files and they are accessible from any computer with the software installed. It's treated like just another folder. Backing up your work is essential, especially if you work between multiple computers, and it allows for healthy backup. Google Docs allows you to store files on the Google servers, as word processing files, spreadsheets, and other familiar formats. Lots of functionality including word count, spell check, and exporting into multiple formats. see this great list of alternatives from the TextRoom google code page. This page was last modified on 24 October 2014, at 20:44.